The fun thing about appreciating art is that it is often subjective. We can learn about a painting, a sculpture, a poem, or piece of music by reading what the experts have interpreted. That doesn’t mean we have to accept what the experts say, or even the artists. We can experience, understand, and appreciate works of art through our own filters. We all have unique lives that have formed the way we think, and see, and hear, and feel. I once did a painting (all in blues) much like the piece I’m going to talk about. My Grandfather took one look at it and said: “oh, it’s a goat… a blue goat.” He smiled at me, patted my shoulder, then moved on to look at the other paintings on display. I did not paint a Blue Goat! 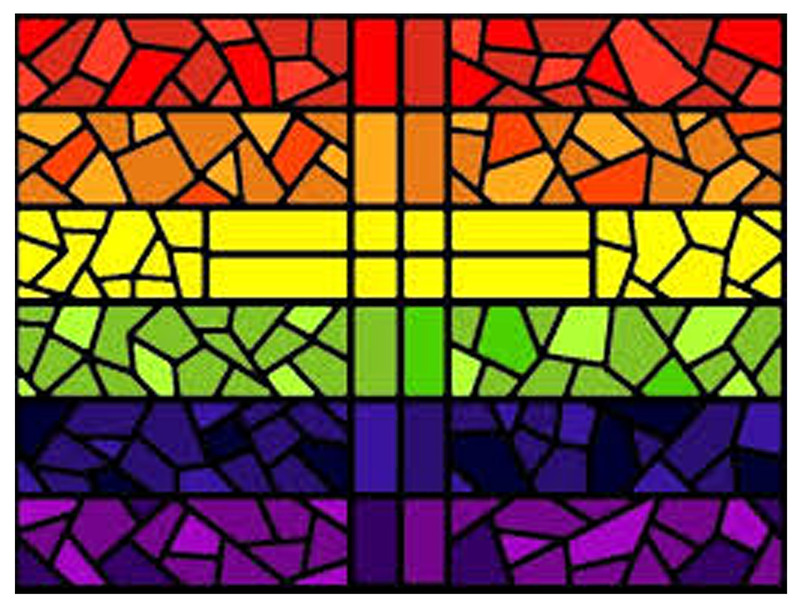 But that was what my Grandfather saw, and he was happy with his understanding of the image and colors he was seeing. I fell into somewhat of a rabbit hole with this current comparison, which was supposed to be three different paintings about “Lovers” and ended up using only one piece. In the beginning of the episode we have Bo going to see Lauren at her lab in the Light Fae compound. Bo is supremely pissed and angry, still, because Lauren deceived her in the intimacy they shared. Her anger doesn’t prevent her from seeking Lauren’s help to solve a case that she and Kenzi are working on however. I imagine that this ^ is what happened in Picasso’s piece; a meeting of some sort (with the two women ) transpired beforehand. The composition is also much like that of the painting, minus one figure. The distance between the women is significant. The woman on the left is content to allow the man to hold her but her gaze is fixed at the ground. The man seems to be more aware, but his gaze is also fixed elsewhere. His hand, however, is pointing at the woman in the robe with the child. This woman’s gaze is firmly pinned on the couple. Who is that woman? And what is she in relation to this couple? It makes no difference, really, whether the women in Picasso’s painting talked or didn’t talk beforehand. What I see, as a subjective observer, is a triangle. A Blue Triangle. Three prominent figures that eat up all the space. Other images are present (and a baby) but the three adult figures are the meat of the image. “The Blue Period” is a well known term that was attached to a period in Picasso’s career by which his palette was monochromatic, with an emphasis on the color Blue. 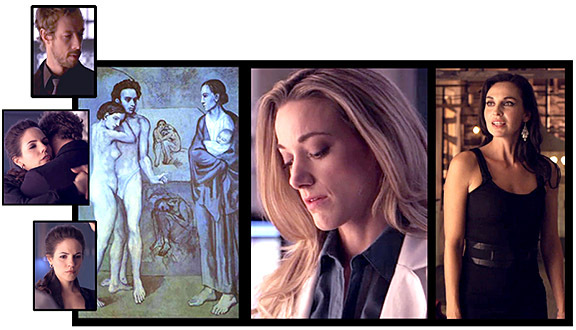 The colors in these Lost Girl scenes are monochromatic as well: blues, white, black, gray and dull beige. Later in this episode Bo returns to the lab, but this time with a dead body. A man that Saskia (who we know is really Aife, Bo’s mom) killed. Dyson is going to “make it go away,” in other words: fix everything for Bo. Bo is overwrought and hugs him in front of Lauren. She pulls away from Dyson though, and says, “I wish you could” because she knows that Saskia is something more and it’s troubling to her. Her trust is placed in Dyson while Lauren looks on. At the end of the episode Bo is depressed ^ and lying in bed. Kenzi comes in to console her. These images work nicely as the two sketches pinned to the wall in Picasso’s painting. They are obviously significant and part of the overall puzzle. I was tempted to make the comparison of how we haven’t changed very much in this modern era. Women are seen to be dependent on men to fix things, be the shoulder to cry on, and rely upon for protection. My first impression of “La Vie” was exactly that. This Lost Girl story seemed to follow the same formula, especially in “The Mourning After” episode. I’m having second thoughts now; about the painting and the Show. The woman with the child is strong and certain. She represents something much larger than the apathy the couple is displaying. And so, too, is the Lost Girl story evolving. The triangle (in its early form) was much like this Picasso painting. The future seems to be more certain, and the hues are multicolored. Illuminating as always. 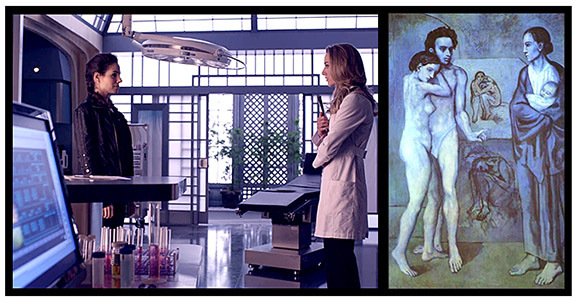 Can we pretend that the Picasso baby is future doccubaby? Kidding. hello Baby Doc. Yes, we believe that the Picasso baby is, indeed, the Doccubaby! And that woman in the robe (holding the baby) is Grammy Binks! She is pissed as hell because Bo is being a wish wash again. LOL. I second BD’s question and if you fell like it, could you elaborate on your second thoughts about the painting and the show? Thank you Nic! To clarify what I meant about having second thoughts about the painting, and the show: I simply meant that I’ve changed my opinion about Picasso’s painting. What it represents. Or, what I thought it represented. And, I’ve also changed my opinion about the Show. Tenatively. Meaning, I may change my mind again next Season. 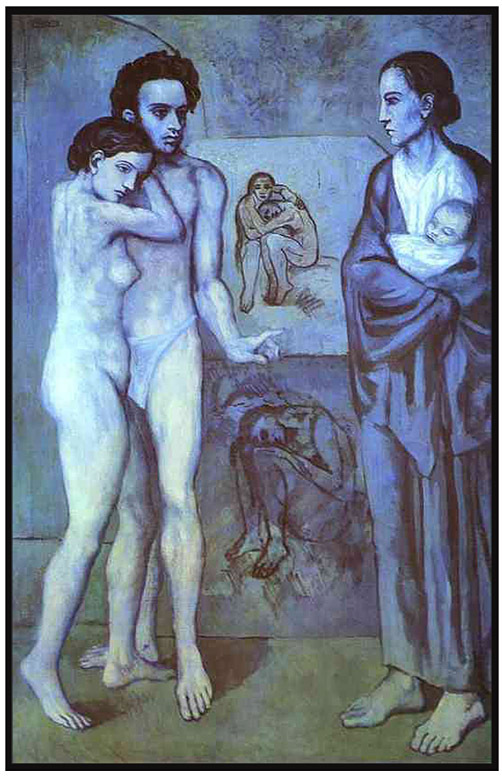 I originally had the impression that Picasso was painting a piece about a man and woman, a couple who had some misfortune, and inevitably it was this female (the woman in the robe with the baby) figures fault somehow. She was to blame. The male was pointing the finger at her and not really looking at her directly. His lover was staring at the floor. It seemed so out of place for the period in time at which this piece was painted. I finally decided that the woman with the child was just a representation of something that couple (together) could never, or would never aspire to: a sense of belonging in the world, a sense of Unity. A sense of belief in itself. Too much apathy and history of mistakes made. Same thing with the show. If the show continues to revisit the Dyson/Bo pairing it will feel as stagnate and forced as it did in “The Mourning After” episode, as well as this past Season Four. The final episode of Season Four gives me hope. Bo has finally realized that Dyson will always be her friend and comrade, but he is not her love. They would remain trapped in blue, stagnate, not growing. They have learned what they needed to learn from on another as a couple. Bo’s entire life is open now, and that woman in the robe, whether it represents Lauren, or Kenzi, or Aife, is what she can aspire to. A sense of belonging to a bigger world, which includes them all. Lauren, Kenzi, Aife, Trick, Dyson, Tamsin. The whole family. In other words: Not the trap of a woman becoming dependent on a single man to be her everything. That unless she has a certain man she can’t be happy. That’s the story we’re sold 98% of the time on television. Lost Girl seemed to do that sometimes, but it also has shown us the strong dynamic of Bo and Kenzi’s relationship, as well as Bo and Lauren’s relationship. Hopefully they won’t toss the beautiful and unique story aside because it happens to be a risk. They have an opportunity to trail blaze. They have, somewhat, and I hope they continue.